Family Owned and Operated since 2003! All Outdoor, Power equipment and Hot water tanks….sold as is! See what we've done to our facility to GO GREEN!!! First Glass by Arch Aluminum & Glass Co.
Arch Aluminum & Glass Co. was going green before we all even knew it was possible. All of their manufacturing plants nationwide recycle 90% of their plant waste, use energy efficient glass tempering ovens, use powder coat paint systems which significantly reduce VDC's, and offer the most green resources in the industry. The Arch glass and windows we selected are called Low-Eglass. These are high performance glasses that reduce heating and cooling loads throughout the building envelope. Low-Eglass reduces heat gain within the building envelope while allowing natural light to enter for a more productive work environment and healthier occupants. The glass also has a minimum of 25% post industrial recycled content. Arch also recycle more than 35% of the glass that is unused during final fabrication. These specific water lines are 100% copper free. Recent studies have shown harmful effects that copper may have on our bodies. The problem with this is that in past years, our water lines have been made out of copper that are now corroding, sending copper particles through our water. We not only use this water to drink, but to wash our clothes and shower as well. By changing our water lines to Zurn Pex lines, we completely reduce the risk of corroding pipelines and increase healthier water content. This drywall used in The Laundromat is made from 100% recycled paper coverings on the face, back and long edges with a green color on the face. This panel is designed to provide extra protection against mold and mildew compared to traditional paper-faced gypsum board products. When tested, ToughRock Mold-Guard Gypsum board scores a 10, the highest level of performance for mold resistance under the ASTM D 3273 test method. In addition to using companies who put a lot of focus on doing more Eco-Friendly services, we have also made it a priority to keep as much out of landfills as we possibly could. We have all recycled and refurbished hot water tanks. We used reclaimed sinks and toilets, as well as a reclaimed mirror and soap dispenser. We also went as far as to find a recycled soda machine to keep our guests hydrated and satisfied. Soon to come GREEN In the near future we plan on installing solar tube lighting, a solar hot water tank, and a rinse water recycling system. All of which will reduce energy costs and shrink our eco footprint right before our eyes. 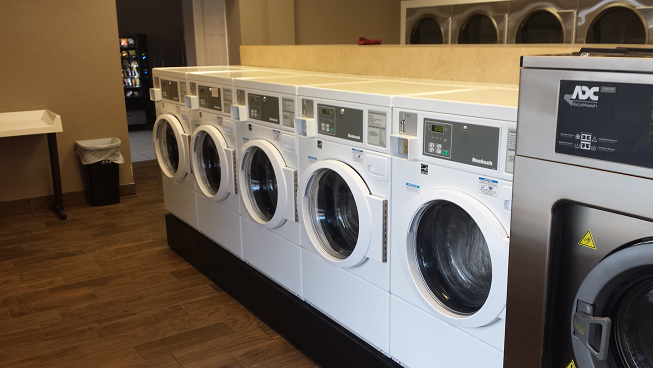 All of our washers and dryers are Energy Star qualified appliances. Each one of the appliances in the Laundromat will use a minimum of 10 to 15% less energy and water than standard models. This, in turn will result in lower energy costs. In the near future we plan on installing solar tube lighting, a solar hot water tank, and a rinse water recycling system. All of which will reduce energy costs and shrink our eco footprint right before our eyes. Thank you for taking the time to contact us. We will make every effort to respond to your comments within 24 hours. If you need immediate assistance please call us at 412-821-8338.